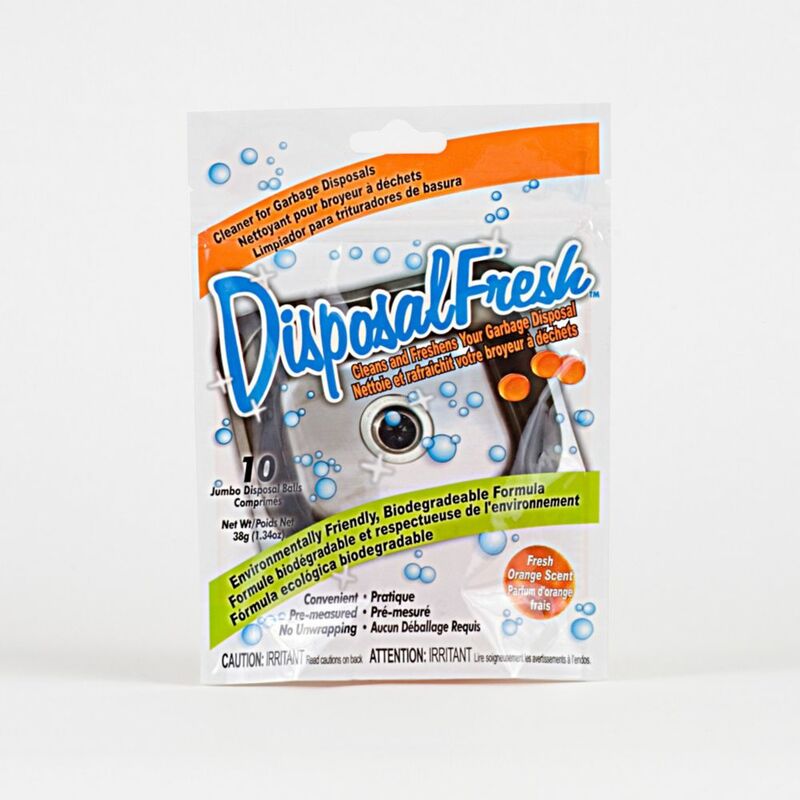 DisposalFresh Garbage Disposal Cleaner & Refresher Fresh Products Disposal Fresh conveniently and rapidly cleans, freshens and boosts the performance of your garbage disposal. Our formula powerfully dissolves fatty deposits, food residue, and other odour causing build ups. Disposal Fresh utilizes new, pre-measured jumbo size disposal balls to make easy work of tough grime. It is incredibly easy to use - just drop it in, and let it do all the work. It will leave behind a clean and crisp orange-fresh scent. Disposal Fresh can be used once a week to keep you garbage disposal at maximum performance. It is safe to touch, no unwrapping is needed, and it uses no harmful chemicals. Disposal Fresh is environmentally friendly and biodegradable. 1 Package of Disposal Fresh contains 10 tablets. DisposalFresh Garbage Disposal Cleaner & Refresher is rated 3.4 out of 5 by 18. Rated 3 out of 5 by Debra from Hdx disposal balls Works okay; would have preferred more lemony smell. Rated 1 out of 5 by afo13 from Not worth the price. They simply don't work for more... Not worth the price. They simply don't work for more than 1/2second. I would never buy again nor take them f they were free, I Ordered a different and better product on line from another store. Rated 2 out of 5 by willy from could not tell if it cleaned or not. Run cycle very short. Fragrance nice but again did not las... could not tell if it cleaned or not. Run cycle very short. Fragrance nice but again did not last long at all. Not tough enough for my disposal I guess. Just perfume.